Strong partnerships are what make businesses thrive and continue to grow year after year, and when partners go out of their way to recognize your excellent work, that’s the kind of good news that you want to share with the world. 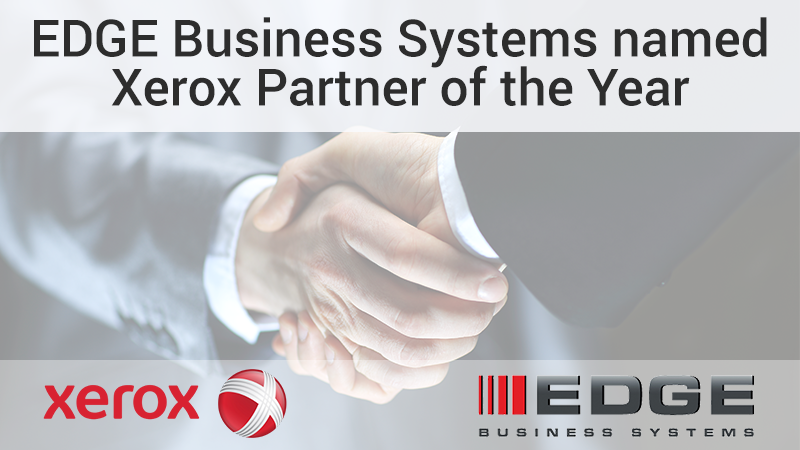 At EDGE Business Systems, we are delighted to announce that we are once again Xerox’s Partner of the Year for Document Management Solutions. The golden rule for color">http://www.office.xerox.com/small-business/tips/color-wheel/enus.html">c... selection is to remember that there are no bad colors; only bad color combinations. Great color combinations are harmonious and empower successful business documents. 1. Use two to three colors. At BLI’s 2011 A3/A4 Testing Advisory Committee (TAC) meeting, representatives from nine printer and copier vendors gathered to weigh in on BLI’s current and upcoming test procedures and evaluation criteria. This year’s participants included Canon, Dell, Konica Minolta, Kyocera, Lexmark, Muratec, Ricoh, Samsung and Xerox. Established in 2006, TAC is intended to get input from key industry participants on BLI’s test methods and reports to ensure the reports evolve to meet the industry’s changing needs. Past meetings have resulted in numerous improvements, including an increased print-to-copy ratio, higher volumes of scan testing and the inclusion of optimum monthly volumes for each device based on vendor-supplied averages for each speed range. In a color survey">https://na1.ipressroom.com/editor/tiny_mce/plugins/paste/pasteword.htm#_... conducted by Xerox Corporation, 69 percent of people said that they understand new ideas better when presented in color. Seventy-six percent of those surveyed say they can find information faster if it’s presented in color. There has been a lot of buzz around two pieces of news –in one case, lack of news—in the past week. Last Thursday, HHS Secretary Kathleen Sebelius responded to heavy pressure from the American Medical Association and announced a delay to the ICD-10 implementation deadline, currently set for October 2013. Meanwhile, the health IT universe continues to wait with baited breath for Sebelius and/or leadership at CMS or ONC to publish the proposed regulations for Stage 2 of the "meaningful use" EHR incentive program. The proposal was supposed to have been out before 35,000 or so health IT industry types descended on Las Vegas for HIMSS12, but it was not to be. As with any major federal rule-making, the White House's Office of Management and Budget has to vet every word, so it is out of Sebelius' hands for the moment. Ever since color television was invented in 1953, color has been critical to telling a visual story. Whether you are a start-up or established business, spending the extra money on color images or color ink may seem out of the question when you are launching a marketing campaign. But using color could mean the difference between whether you’re marketing materials get read, or tossed into file zero—the trash. Putting it simply, color gets noticed. Printing in color can improve retention, productivity and generate significant financial returns. A recent Xerox Color Survey reported that 76% of respondents said they could find information faster when printed in color. So as you think about developing collateral materials for your small business -- think color. Create a color logo: There are five common principles of logo design. A logo must be simple and memorable which means it is easy to recognize. A logo must also be versatile & appropriate. This means it can be scaled to any size and it must be right for your type of business. You wouldn’t use an elegant font for a pizza joint. Good logos feature something unexpected or unique without being over the top. An effective logo should be timeless and stand the test of time. Always use at least two colors in a logo and hire a professional to assist you. Your company name in a stylized font is NOT a logo. I had the opportunity recently to attend this year’s Healthcare Forum, put on by Xerox’s the Breakaway Group, an organization whose mission is to improve healthcare through optimization of the electronic health record (EHR). The forum brought together about 100 leaders from healthcare delivery organizations, academia, and industry. We had the great opportunity to take a break from our daily grind to step back and take a look at the big picture. Clearly much progress has been made, but there is still so much more to do to improve healthcare and its use of information technology. In my reflection of the event, I had the opportunity to gather some thoughts on what the biomedical and health informatics (BMHI) field must do to contribute to the larger picture going forward. The last few years have been very good for those who work professionally and academically in BMHI, which I have defined as the field that is concerned with the optimal use of information, often aided by the use of technology, to improve individual health, health care, public health, and biomedical research . The Health Information Technology for Economic and Clinical Health Act (HITECH) Act has provided tremendous opportunity to expand the use of informatics systems to improve health. At the 2012 Graph Expo held recently, the majority of vendors sharpened their focus on solutions and services, as well as new finishing options and other accessories to existing engines. Indeed, a common theme was that while hardware will always be extremely important, commercial printers must continue to migrate not only to digital printing versus offset, but also focus on becoming a true partner and full-fledged marketing providers to their customers. There were some major engine announcements, though, including Konica Minolta’s sneak-peek at an upcoming color inkjet cut-sheet press. Developed in conjunction with Komori, the KM-1 Inkjet Press offers speeds up to 3,300 sheets per hour in simplex and 1,650 sheets per hour in duplex. Xerox also unveiled the latest additions to its Nuvera product line, with the launch of the Nuvera 157 EA and Nuvera 314 EA Production Systems, the latter of which features Xerox’s dual-engine architecture to output at speeds up to 314 duplexed images per minute. The Canon imagePRESS C7010VPS and C7010VP Series was exhibited with the OLEC Swift UV Roller Coater, which extends the life of prints and helps prevent wear and tear. According to Sandra Pereira, product marketing specialist for Canon, UV coating can enhance a variety of materials, including direct mail, tags and labels, posters and book covers and jackets. In addition to preventing scratching and fading, UV coating protects against humidity and water damage. Designed for exclusive compatibility with the imagePRESS digital press, the UV coating is applied inline and includes a bridge unit that transports the printed image after being output. The output then enters the coater, where the solution is applied and instantly dried via ultraviolet light. The system also includes an interface with the ability to program preset functions.